Heavy duty shade cloth is an industrial textile made from high density polyethylene, and combines Ultra Violet (UV) stabilisers and colour additives. During the manufacturing process imperfections may occur. These imperfections are cosmetic only, and will not impact or interfere with the life of the shade fabric or the function for which it has been designed. It is recommended that shade sails are installed by a properly trained and certified building consultant, particularly for large structures. If unsure please check with your local Council. Your shade sail canopy should be installed firm and tight so as to reduce wind flap in the shade fabric. Shade fabric that is loose and sloppy will cause premature failure due to mechanical breakdown. This is not UV breakdown and is not covered by the warranty. The shade sail will require periodic maintenance to ensure that the shade cloth fabric remains tight. 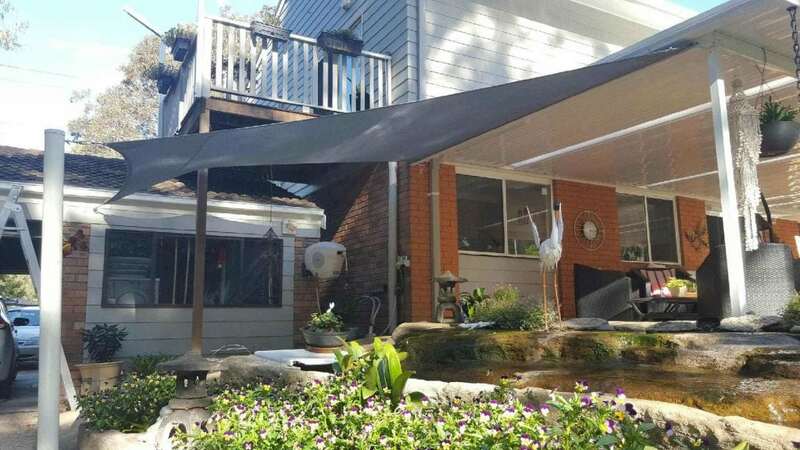 Your shade cloth canopy may become dirty over time. Care should be taken to avoid chemicals that may contain bleach, or other agricultural chemicals containing Sulphur or Halogens (eg Chlorine or Bromine). These chemicals may attack the UV stabilisers within the shade cloth, thus reducing the life of the product and negating the warranty. The following list of chemicals that may cause such interactions are only some examples and not exhaustive. Such chemicals may include: pesticides, metals, metal oxides and metal salts, all halogens and chemical compounds containing halogens or sulphur in all their oxidation states. Care should be taken to avoid exposure to petrol, oils etc. When cleaning the shade cloth, we recommend the use of a mild dish washing liquid with the use of a low pressure water hose and a soft scrubbing brush. We do not recommend the use of high pressure water, to blast the fabric clean. The fabric warranties are not covered by such damage caused by storms, hailstorm, earthquake, mechanical damage done by birds or other animals, fire, lightening etc. Again this is not an exhaustive list and it is for reference only. Please refer to your product warranty, for further installation and design details. If you remove the shade sail over winter, ensure that it is stored away from rats and mice, preferably stored in a protective bag in a cool, dry location. It is not recommended that you put creases or sharp folds in shade cloth and it is best not to place heavy objects on top of it during storage.